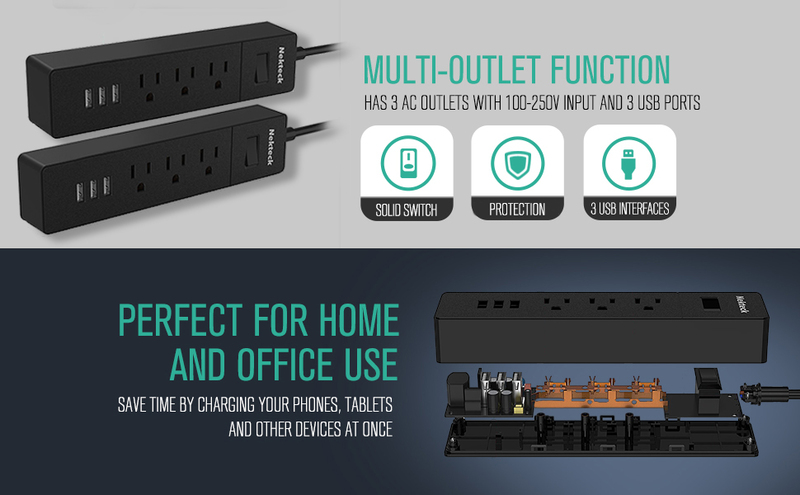 Protect your devices from power surges with Nekteck Multi-Outlet and USB Surge Protector. It has 1700 joule energy rating that provides standard protection for your electronic devices. It is safety designed with overload protector which makes it turn off automatically once the load power exceeds the rated power. 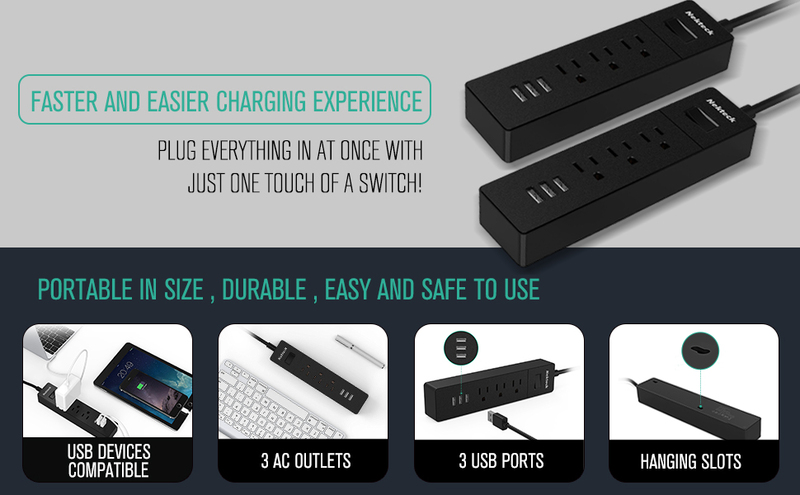 This power strip has 3 surge-protected AC outlets, 3 built-in USB ports that provides 3A maximum and ON/OFF switch. It has built-in IC with supercharge technology that smartly detects your device to deliver its fastest possible charge speed up to 2.4A on each port. The USB port can charge Apple and Android phones and other USB devices. Here are some FAQ’s to help you better understand how this power strip works. The power light stayed on even thought the switch is in the off position? The power strip turn itself off for unknown reason? The power strip is built with overload protection, when connected appliances overpowers the power strip, it will turn off automatically for safety reason. We recommend to get Outlet Saver/ Extension cord [Search on Amazon] so that you can utilize all of the outlets even the plugs are bulky. USB charge my device slow? 3 USB ports share 3A total output, so it will automatically adjust down charging current if you have multiple power hungry devices connected (for example: multiple tablets). Compact powerhouse that fits in your back pocket, will jump start your car, Also charges smartphones, tablets, speakers, and more. Built-in Super bright LED flashlight in case you are stranded at night. Safety protection for overcharge, overvoltage, overcurrent, and short-circuit. USB IF CERTIFIED TID: 3,270,000,054. TYPE C Cable. Nekteck USB 3.1 Type C to A Female Cable qualifies the USB C standard. It’s fast and safe to use, also, It will not damage your device and provides you the best possible performance. HIGH-SPEED DATA TRANSFER: Slow data transfer? Worry no more! The USB 3.1 Gen 1 offers the speed up to 5 Gbps data transfer. COMPATIBILITY: The Nekteck USB Type C to USB A Female can offer your Type C smartphone connects with the OTG flash drive and provides your MacBook an extra USB A Female port by which you can connect your USB C laptop to a card reader, flash drive, keyboard,and printer. USB TYPE C DEVICES COMPATIBILITY: Compatible with Apple New MacBook 2016 & 2017, Samsung S8/S8 Plus, Google Nexus 5X/Nexus 6P, Oneplus 1/2/3/3T, etc. Easy to use, Just put your Qi-enable device on the pad and comes with a Blue light indicator to show charging start. What You Get: Nekteck Fast Charge Wireless Charger Stand, Micro USB Charging Cable, User Manual, 18-month hassle-free warranty lifetime customer support.